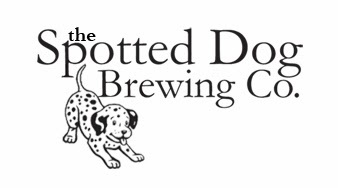 Beer Travels -- Belgium/France ~ Spotted Dog Brewing Co.
My wife and I recently returned from our first, hopefully of many, trip together to Europe. As my wife is a huge Francophile, we spent the majority of the trip being tourists throughout Paris. 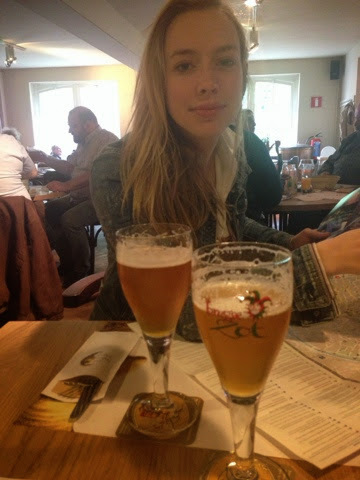 Since we were in the area, I convinced her that we should pop up to Belgium for a few days and crush some delicious beers before we return to the States (she didn't need much convincing). Our plan was to spend 6 days in Paris, take a quick Thalys train north for 2 days in Brussels and 1 day in Bruges. Both of the countries are spectacularly beautiful places, so much so that it really makes American cities pale in comparison. We had a wonderful time in both spots and we really were upset coming home. In both cities we booked lodging via AirBnB. If this is not a service you've used in the past, I highly recommend it. Compared to a regular hotel, its much cheaper and it places you in the "real" neighborhoods of a city so you can really feel the culture and live the life. This is the third time I've used AirBnB and I really don't think I'll book hotels again unless absolutely necessary. As beautiful of a city as Paris is, there really is no beer scene that I could find. Almost literally nothing. France is truly still a wine country which is somewhat amazing considering the level of globalization these days and the merging of beer into gastronomy in the States and elsewhere. We stayed in the fashionable Le Marais section in the 3rd arrondissement. This section is fantastic and is filled with cafes, wine bars, great restaurants, art galleries and tons of shopping. It also has a much older/historic feel than most of bustling Paris. We did stumble upon one decent beer bar in Le Marais, L'Art Brut Bistrot. The bar, which we originally thought was a restaurant, is right off of the Pasage Moliere -- this is literally just a passage between buildings that you could easily walk past. The small bar had a great ambiance and looked to be filled with students as the crowd trended young and I heard several different languages. L'Art Brut Bistrot had a decent beer list compared to elsewhere we dined in Paris with the menu having a few Chimays and the like. Nothing to write home about, but decent for Paris. The staff was incredibly friendly and seemingly very appreciative that we tried to stumble around the French language -- to which they always answered in English. They taught us some new phrases and were genuinely happy that we had found their little bar. I really only drank beer on one other occasion in Paris. Many of the cafes/brasseries were advertising something called Picon Biere. Figuring that this was just a local Parisian beer that isn't exported, I ordered one with the intent of trying the local flavor. The French aren't particularly known for their beer, but I assumed this was just some local lager. What was delivered to our table was a total abomination. Apparently, I have since learned, Picon is actually a liqueur derived from fresh oranges. What is done in Paris, is a bar will take something like a Heineken or a Kronenbourg and add some Sirop de Picon to the beer. It lends the beer a ginger/orange type flavor with the aromatics just leaping out of the glass from the effervescence of the base lager. It was truly atrocious. But, beer aside, this is a wonderful city. I was in awe over the sheer size of some of the public spaces that were impeccably maintained and open for all citizens to use. I can't imagine undertaking some of these public works in the States without us falling all over ourselves with the politics. 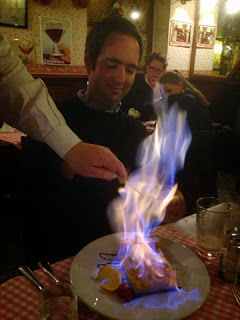 The sights, food and people we met in Paris were all very kind and friendly. It's an incredible city that I know I'll visit again. This little shop along a quiet street in the Ixelles neighborhood is quite the little gem. Upon walking through the front door, you're greeted with shelves after shelves of some of the finest beer on the planet. 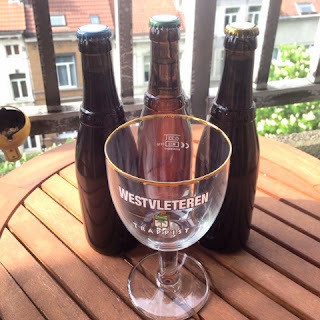 At first we grabbed a bottle of Girardin Kriek and were going to crack that at a table in the store (which also boasts a small cafe geared to beer paired finger foods) when my wife noticed a few wooden crates marked "WESTVLETEREN". Since I hadn't shut up about Westy's for several days, she expertly guided me towards a pallet that I just wanted to fall on top of and snuggle my way into the middle. Beer Mania had several stacks of Westy Blonde, 8 and 12. Now, since, like us, Belgians are capitalists, the Westy's were all priced outrageously at €12 a bottle. Did that stop me? Of course not! A bottle of each please, s'il-vous-plait! This is truly just a stupid beer list. There was so much more that I wanted to try but considering we had to find our way home in a strange city where we don't really speak the language I felt it best to cut myself off. I was almost wishing that beer didn't get you drunk so I could keep trying more...almost. By now the Westy's had cooled in the fridge so we got to tasting. These have been written up ad nauseam, so I'll be brief. Westy Blonde -- This was a wonderful beer. I don't often drink blondes in the States just because there are so many tasty, thirst quenching IPAs available, but this beer was really nice. I'd say its probably the best example of the style that I've tasted, although its probably outside of the official BJCP IBU guidelines -- it seemed a tad hoppy to me. 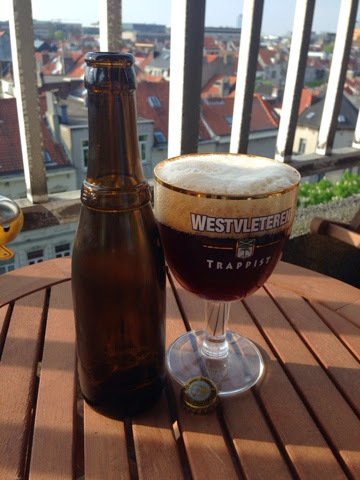 Westy 8 (Dubbel) -- This was the very first of the Westvleteren's that I tried and I was a bit worried. I'm typically not a huge fan of the style, and I have to admit this didn't sway me all that much. It was very nicely malty, its just not a flavor that I prefer all that much. Westy 12 (BDSA) -- Perfection. This was definitely the best quad that I've ever sampled in my life. It's very hard to live up to the stupid hype of "best beer in the world", but I feel this one did pretty well. It pours with a thick, rich head and has a very creamy, full mouthfeel. I've brewed several clones in my day and I'd say that the taste of mine are pretty close, but the true 12 had a much more "buttery" texture to it that was just fantastic. Not worth importing a case of it at close to $1000, but I'm glad I paid the 12 euros to try it. Visiting the Brasserie Cantillon in the southern section of Brussels was a day that I will long remember. The walk takes you through a bit of a rougher neighborhood with a predominantly Middle Eastern ethnic makeup. It is hardly the area in which I imagined I would find one of the most revered breweries in the world. The outside of the brewery itself is incredibly unassuming. I had known that space constraints were a major factor in the scarcity of Cantillon brews, but never in the world would I have thought it would be this small. The area around the brewery does feel a little rough and you can't help but wonder how much this has changed over the years. The building density also makes it very evident that it will be impossible for the current brewery to expand production on a meaningful basis. Relocation would be difficult with regards to spontaneous fermentation -- who knows what you'll get in a new location? The brewery opens up into a tasting room, maybe "area" is a better word, that also doubles as barrel/pallet/bottle storage. Everything was very crowded the day we were there as the Zythos beer festival was the same weekend. As Cantillon doesn't participate in Zythos, most festival-goers made their own stop on the day that we happened to visit. Oh well, the more the merrier. Cantillon runs a self-guided tour (guided tours available with advance notice) throughout the brewery with a very detailed pamphlet about their process as you go from grain to glass. For a self-guided tour it was surprisingly well done. When we did the tour the brewing season had recently ended (October-April) so they really allowed you to walk freely around the whole facility. 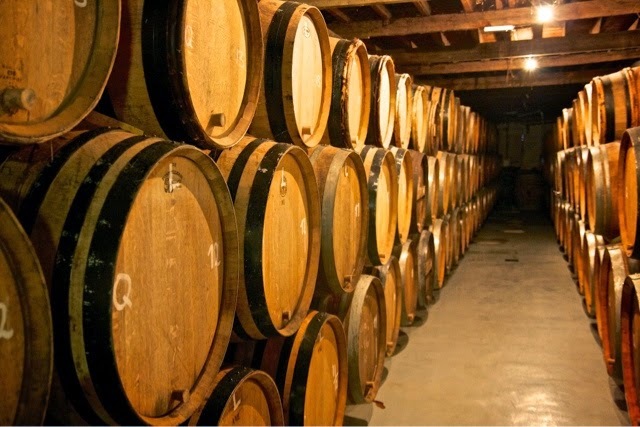 At the conclusion of the tour, all guests are invited to try a half glass of Cantillon Gueuze, followed up by your choice of either Kriek, Unblended Lambic or Iris. After the tastings, they run a bar that has multiple Cantillon varietals along with the occasional collaboration. 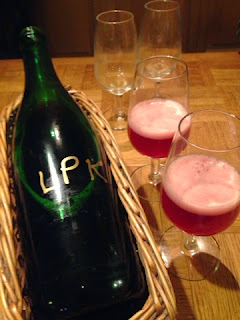 We sprung for a bottle of the Lou Pepe Kriek. 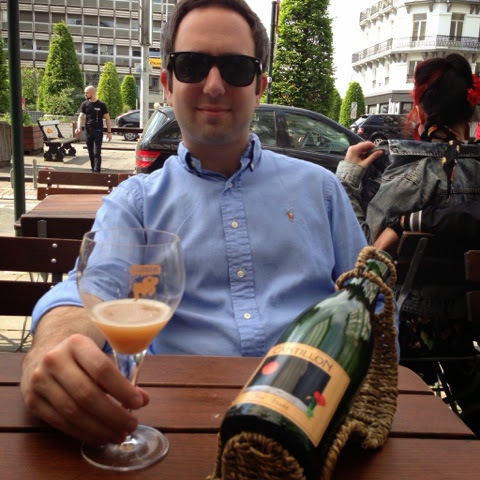 The Lou Pepe series of Cantillon are probably as close to a "brewer's reserve" that you could get. The Lou Pepe Kriek is a two year old lambic aged in wine barrels and sit on top of a generous (close to 10lb per 5 gallon) amount of tart cherries. It is simply wonderful. One of the great things about getting this beer at the brewery is that it totally lacks any type of label and just has an "LPK" marked on the bottle. While tasting, we ran into a few other Americans beer nerds and had a great time. One of the Americans was a Chicago guy who is a master BJCP judge and was in town for the Zythos festival. One of the other American's was a brewer from the Brauerei Uerige in Dusseldorf who had graduated from the Siebel Institute in Chicago. Fantastic nerdery proceeded. 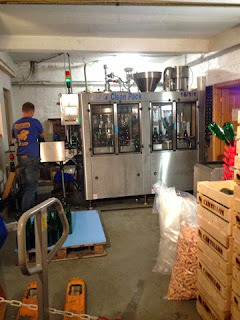 In all honesty, the Cantillon tour should be mandatory for all beer nerds world wide. The train to Bruges takes roughly an hour and leaves from any of the three Brussels stations. It's a "commuter" train so you can go to the station on the same day and buy tickets. Trains seemed to be leaving every half hour. Bruges is simply a magical city. It's a beautiful place that is completely overrun by tourists during the day. We stayed somewhat into the evening and by around 7pm the population of the town had fallen by close to 90%. That said, we still very much enjoyed Bruges. 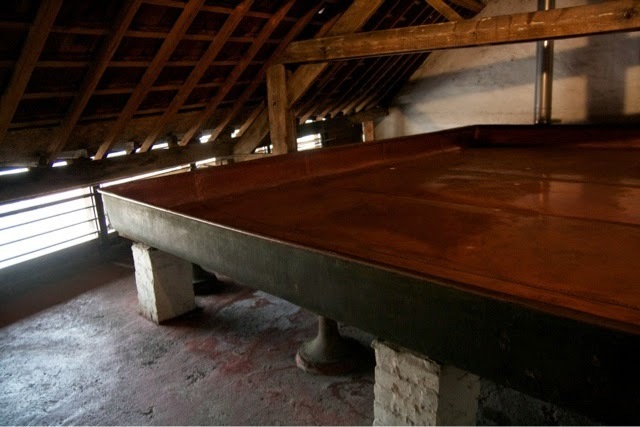 Within the city limits of Bruges, there is only one brewery still in operation. Brouwerij De Halve Maan offers a 45 minute tour (which we did not take) and a very large, modern taproom/restaurant. De Halve Maan is famous for their Bruges Zot Belgian Blonde beer, the unfiltered version of which can only be purchased from the taproom at the brewery. The beer has won numerous gold medals including the World Beer Cup in 2006. We decided to pair this with a pot of the Flemish Stew for Two. This was a wonderful slow cooked beef strew that paired perfectly with a dry Belgian Blond. De Halve Maan also offers a dubbel, tripel and quad, however in the spirit of sightseeing we didn't get a chance to try these. Moeder Lambic -- They have a nice mix of finger foods, antipasti, tartines and quiches. We tried a mixed plate of antipasti and it was HUGE. It was really nice to snack on while tasting some Cantillon. One plate served two easily. It wasn't anything particularly Belgian, but it was delicious nonetheless. Waffles -- Get them. Get them plain. Get them with sugar. Get them with nutella. Get them with anything. Just get them and don't stop. Chocolate -- We stopped by Passion Chocolat and got a small box of chocolates. It was fantastic. The girl behind the counter was extremely friendly and loved giving us samples -- which we gladly accepted. In 't Spinnekopke (The Spider's Web) -- This is a cozy, beer aficionado restaurant on the west side of Brussels. If you are a non-French or Dutch speaker, be forewarned, the staff seemed a bit shaky on English. Luckily we have a bit of French under our belts and managed to mumble and point our way through the menu. We had the "Mussels Au Gratin" (super cheesy deliciousness) and escargots. Both were fantastic. For dinner my wife had the duck breast and I had rabbit cooked in lambic. As you can assume, that was also fantastic. For dinner we polished it off with a waffle on fire -- because...why...wouldn't you? 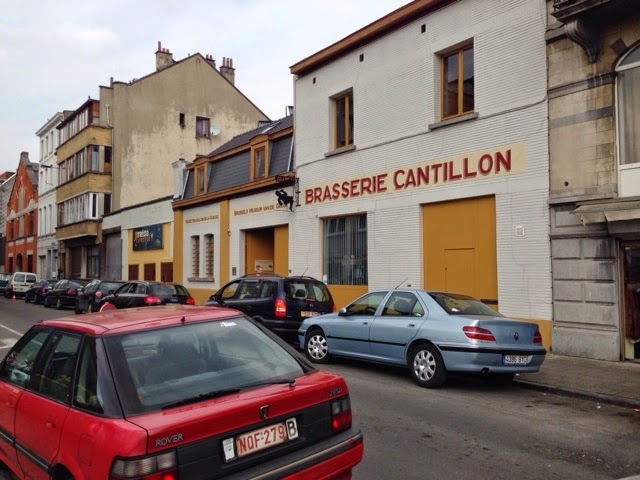 Cantillon, Boon, and Drie Fonteinen can all be had here. Dell' Arte - We got an early dinner here while in Bruges. The service was overly nice and probably spoke better English than I do. I had another rabbit, this time in kriek. Again, fantastic. This simply was an amazing trip. The quality of food, wine and beer consumed was incredible. 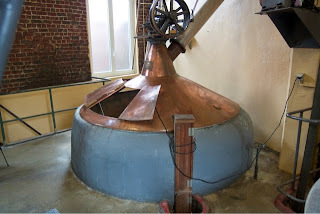 If you get the chance to swing by Brussels for a day, Cantillon and Moeder are simply must do's. I can't wait to get back.